We have a service team who can handle your needs, large or small. We have installed small 12 foot residential flagpoles as well as the largest flagpole in the Southeast standing at 234 feet high. 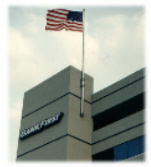 Our service technicians will install new flags or banners for your home or business . We will also repair your tattered and torn flag in order to extend their life. We provide all auto dealers with a complete line of advertising materials specially designed to attract attention to their dealership. We'll transform your parking lot into a "sales lot". 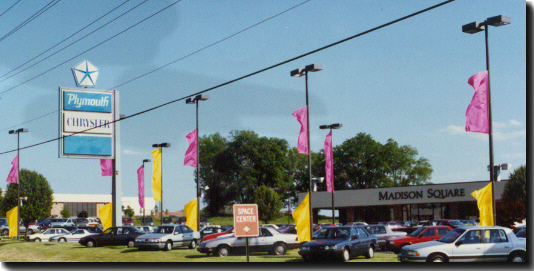 We offer a wide variety of streamers, flags, flagpoles, and banners to enhance the visibility of each individual lot. If you can send us a sketch of you lot detailing the layout of light poles, building, entrances and the main street, we can prepare a design sketch that will be sure to please you. 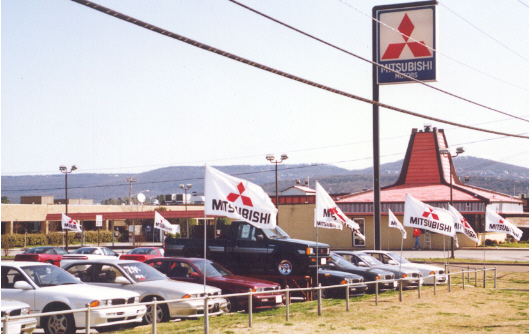 This is a "tried and proven" method of increasing automotive sales.